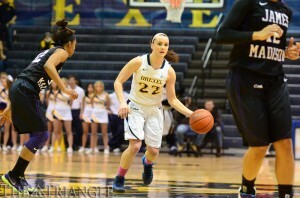 Point guard Meghan Creighton finished with 10 points, six rebounds and three assists in Drexel’s 69-58 loss to James Madison University Feb. 16 at the DAC. The sophomore has started all 27 games for the Dragons so far this season. This past week, the Drexel women’s basketball team lost an overtime heartbreaker to slip into a three-game losing streak, but recovered a few days later to get back on track. The Dragons let one slip away Feb. 23 against Northeastern University. On their home floor in Boston, the Huskies won their first game against Drexel in over six years, snapping the Dragons’ 10-game winning streak in the head-to-head series. Drexel led for about 38 of the 40 regulation minutes before allowing the Huskies to tie the game in the final minute. The Dragons’ 15-point lead was officially gone when Tanisha Hopewell put back a second-chance bucket — a category of shooting that got Northeastern more than triple the points it got Drexel — to tie the score at 61 with 48 seconds to play. According to head coach Denise Dillon, the team went into a funk in scoring, and this unsuccessful trend carried over to the defensive end. Eventually the team tensed up and the walls closed in on them. The Dragons came out of the gate firing, converting 56 percent of their first-half field goals. A barrage of early threes gave them a 22-7 lead in the first half. Though Northeastern tried to chip away at the lead, Drexel responded, giving itself what, at the time, seemed to be a comfortable margin. The Dragons’ offense did not keep up its first-half pace, but still did enough to hold a nine-point lead with seven minutes left. Despite leading for much of the game, two of Drexel’s key producers, Meghan Creighton and Rachel Pearson, were struggling. The sophomore duo combined to shoot just 6-25 from the field. Creighton, the sharp-shooting point guard, did not get much breathing room to shoot accurately, and Pearson was in the midst of a shooting slump. That being the case, the Dragons needed someone to step up. 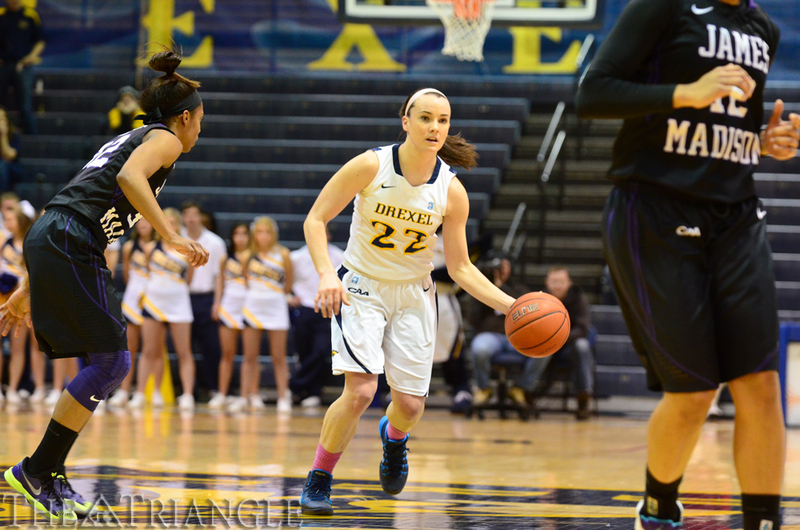 Heading Drexel’s scoring was senior Fiona Flanagan. Doing everything she could to position the Dragons in the best spot possible for her last Colonial Athletic Association tournament, the senior matched a career-high with 19 points. Playing with the same type of hunger in her senior season, Tory Thierolf also stepped her game up. For the second straight game she scored a career-high; this time notching 16 points. “It was nice. You can see our seniors realizing the end is near, and I think they’re trying to do everything possible out there,” Dillon said. In overtime, Drexel mentally — and physically — ran out of steam. In the first of two overtimes, the Dragons surrendered the lead to Northeastern for the first time since the opening seconds of the game. They came back and led by three with less than 30 seconds left, but a three by the Huskies’ Kazzidy Stewart tied the game at 69 and it was off to a second overtime. That was when the Dragons completely lost their legs. Drexel failed to make a single field goal in the second overtime, and Northeastern took the game, 78-73. Dillon chalked up the lack of scoring to mental and physical exhaustion. Whatever happens, Dillon has one goal that could bring them success not just this season, but heading into 2014-15. As the seniors continue to claw and fight, knowing the end is near, Dillon would like to see the rest of the team support each other as they are running out of time. The Dragons improved their conference standing Feb. 27 at the DAC, as the team defeated the visiting University of North Carolina Wilmington Seahawks by a score of 56-45. Drexel is now in the home stretch of the schedule, heading into the CAA tournament. The Dragons start their final week of the regular season with one last road game against Hofstra University on Sunday, March 2 at 2 p.m.